Google rolled out a handful of improvements to Google Docs on Monday that make it an even more compelling business tool. This time the changes focus on the document overview window that appears when you first access Google Docs. Up until now this has merely been an area where documents could be created uploaded, or opened for editing. However, it now features significant organizational tools. For example, there's now a preview and information pane at the right-hand side of the display, showing thumbnails of documents, images, and movie files, and giving you the option of identifying files at a glance. Beneath the thumbnail is displayed information about the file, such as whether it's shared, or the last time it was accessed. Because you can preview a file rather than simply just opening it, selecting files now happens in a slightly odd way. Directly clicking a filename opens that document for editing, as before. However, clicking the white space to the right of the filename selects that file so you can preview it. Additionally, an Action dropdown displays, by which you can share, move and do other things with the file. Double-clicking the name of a file to open it might seem more intuitive but Google Docs works within a Web browser window, where single-clicking has been the norm for 20 years. I guess the Google Docs folks didn't want to rock the boat. Folders and labels are abandoned in favor of Collections. Essentially these are folders in all but name, although you can assign files to more than one collection. You can place documents in a collection by selecting them and clicking Actions, then Organize. The crucial new feature is that you can share Collections with others, just as with individual documents. You could create a Collection for a project you're working on, for example, and share all the files with a colleague in one fell swoop. Running along the top of the file listing are several filters, activated with a single click. You can choose to view only spreadsheets, for example, or just video files. 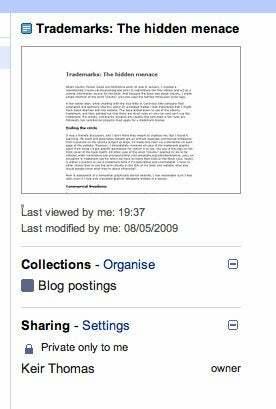 You can also view files based on who created them, or whether they're private or shared. 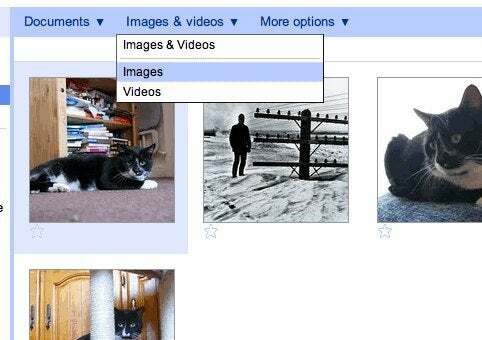 Selecting the image or video filter shows thumbnail previews of them, and you can also view these as full-window slideshows by clicking Actions, then Slideshow. Multiple files can be selected by holding Shift or Ctrl, as with elsewhere on your PC, and right-clicking also brings up a context menu. All in all, there's a lot to like here, but it isn't perfect. A test video file I uploaded a few weeks ago wouldn't display in the preview pane the day these features were announced, for example. All I saw was a spinning progress display. Additionally, thumbnail previews that should have appeared in the controller at the bottom of the pictures slideshow were absent. I began to wonder if Google hadn't rolled out these new features too early. Throughout my testing I used the Google Chrome browser. I have to presume Google tested its online software in its own browser. Additionally, previous predictions about the preview pane being a multimedia jukebox of sorts haven't come true; you can't play MP3 files uploaded to the Docs space, for example, and there's no way of creating a playlist. Ah well; maybe next time. Because of this, the new organizational tools indicate that we're no closer to the concept of a true "G-drive" in which Google offers file playback and viewing facilities for any kind of file or document that users upload to its cloud. It's pretty clear that, at least for now, Google Docs still very much focuses on office documents, plus image and video files. Note that not all account holders will get the new features immediately, although various Google accounts I use (including Google Apps for Business accounts) all featured the new setup immediately.